We will match you to a Mortgage Advisor who will truly understand your requirements. Find out what your mortgage options are. It takes just 60 seconds and doesn’t require a credit check. 1 minute. That’s all it takes to find out if you are likely to be accepted for a commercial mortgage and it won’t impact your credit score. We will match you to a Mortgage Advisor who will understand your circumstances and help secure the best commericial mortgage for you. We hear from customers every day who are looking to take out a commercial mortgage but are unsure where to start. This is why we decided to put together this guide that should hopefully clear up any of your questions. What is the definition of a commercial mortgage? How do commercial mortgages work in the UK? How do you apply for a commercial mortgage? What does the loan application process entail? Am I eligible for a commercial loan? How can I find the best commercial mortgage? How long should I expect the terms to be? Can I can a commercial loan as a small business or startup? How can I speak to a specialist commercial mortgage advisor? To discover the answers to your commercial mortgage questions, read on below. If you are still unsure about your options, get in touch with our of our specialist advisors. Simply put, a commercial mortgage is similar to a personal mortgage, only it is used to purchase business premises or sometimes even a business, such as a franchise. Instead of being attached to an individual or couple for residential property, commercial mortgages are taken out of businesses or business owners. Aspiring business owners may even be able to secure a business mortgage in order to get their business off the ground. A commercial mortgage is one step up from a business loan, which would typically be capped at £25,000 and unsecured. In contrast, a commercial mortgage will allow you to borrow much higher amounts and this would be secured against the property or business. Is a business mortgage loan different? You may sometimes see a commercial mortgage referred to as a business mortgage loan. This is actually the same thing and just refers to the mortgage which is used for business purposes online. What kind of commercial mortgages are available? There are two main types of commercial mortgage loans available. Commercial investment mortgages are typically used to invest in property that you plan to let out. Owner occupier mortgages are typically used to purchase the trading premises for your business. Is my commercial mortgage just like my residential mortgage? This is covered in more detail later in the guide. Commercial mortgages work in a similar way to residential mortgages. Most people cannot afford to buy a property outright, so instead offer a deposit on the total amount and then take out a loan to cover the rest of the property value. You will then pay off the mortgage in instalments every month for the duration of the loan. In most cases, you will pay back the mortgage and the interest accrued on the borrowed amount. In some cases, you may be able to take out an interest-only mortgage and then pay back the mortgage amount at the end of the payment terms. A lender will want to see evidence of a payment vehicle before agreeing to this type of mortgage. Now that we understand what a commercial mortgage is and what they can be used for, we can now look at the process of applying for one. Before you get started with the application process, it’s important that you understand the process and your obligations. So, how do I secure a commercial mortgage? The process typically starts by approaching a specialist broker with in-depth knowledge of the industry. They will want to get to know you and your business and help you to make a decision that will be right for you. They will be able to connect you with the right lenders who are more likely to accept your application. Things like affordability and eligibility will first be taken into consideration before taking the first steps. You will need to provide at least three year’s of financial records and be prepared to answer some tough questions about the status of your business. You find a commercial mortgage broker who can match you with the right lender for your needs. You will be asked to complete an asset and liability form for your business in order to demonstrate affordability. If the lender is satisfied that you can afford the repayments, they will invite you to complete a commercial mortgage application form. The lender will ask to see more details of your business’s performance. You will be asked to provide three years’ financial records. Just like with a residential mortgage, if everyone is satisfied, the commercial mortgage underwriting takes place. A valuation of the property takes place, in addition to a valuation of any properties or assets put us as security. Your business will also undergo a valuation. If everything is in order, the solicitors will finalise the deal. In addition to the asset and liability form listed above, you will also need to provide the following documents as proof of eligibility. If you are a Limited Company, you will need debentures and personal guarantees from all company directors. The actual requirements will vary depending on your lender. This is just a guidance. You may be asked to provide more documentation or even less. It all depends on your business and personal circumstances. What costs can I expect to accrue? Commercial mortgage arrangement fee: This is typically charged on completion and is usually around 1-2% of the total loan amount. Valuation fees: These can vary by property, but unlike residential valuation fees, you won’t have to pay this upfront. Broker fees: Most brokers will charge a fee of around 1% of the loan, but this is only on success. Most will refund any payments if they are unable to secure your mortgage. Legal fees: These usually start at around £500 per party but working with the right broker can help you to keep these costs down. In many cases, the primary eligibility requirements are down to affordability. If you can afford the repayments and can offer evidence to this, then you will be accepted by most commercial mortgage providers. It is only in situations where you have a smaller deposit or where you don’t have a full three years’ accounts that you might struggle to secure a commercial mortgage. What are affordability and serviceability? Affordability is calculated in a different way by every lender. This is why it’s important to apply through a speciality broker to increase your chances of being matched with the right lender. Commercial lenders will only want to see that the loan will be serviceable, which means that your projected income for your business will be enough to make payments for the life of the loan. In general, business lenders will look at something known as earnings before interest, tax, depreciation and amortisation (EBITDA). There are no rules for the amount you need to be earning for it to be considered serviceable, and every lender will make their own call on this. As mentioned above, a commercial mortgage will typically require a higher deposit than a residential loan. In general, you should aim to secure a deposit of around 25-40% of the value of the property. If you can only secure a deposit on the lower end of this scale, working with a specialist broker will help you to find a lender more willing to accept your application. How can I get a commercial mortgage with more than 75% loan to value? If you are unable to get more than a 25% deposit, you may be able to use other assets as security. This can include your personal home, which would be used as a security against the loan. If you have significant assets, you may even be able to get a commercial mortgage with no deposit. If either you or your business has a poor credit history, you may still be able to secure a commercial mortgage provided you meet the affordability, serviceability and deposit requirements. There are plenty of lenders out there willing to work with those with poor credit history. However, be prepared to be offered less than favourable rates. There are ways to offset a poor credit rating. For example, if your company hasn’t been trading for long so you don’t have an extensive credit history, you may be able to put up a larger deposit to reassure lenders. Will I need to share a business plan? Some lenders base their decision on the viability of the investment. This means that they will want to see your future plans for the company in the form of a business plan. This is particularly true for commercial investment mortgages as the entire business rests on the projected rental income. For commercial investment mortgages, you may need to demonstrate that your rental coverage will reach as much as 190% or around 130% for buy-to-let. However, this number varies between lenders and could be as low as 110-125%. Your business plan should also include information about you and your experience in the industry as this can have a huge impact on a lending decision. Speaking to an experienced mortgage broker is the best way to get access to the best deals. All commercial lending is bespoke, but there are some lenders who will look more favourably on your situation than others. All mortgage lenders will look to balance the level of risk associated with lending to your business. If you have poor credit and little to no trading history, you will be less likely to be able to secure a commercial mortgage than someone with a good credit rating and a successful trading history. Lonan to Value Ration: The more deposit you can provide, the better rates you will be offered. This is simply because you are able to offset some of the risks of lending to your business by providing more security. Remember you can boost your deposit by offering other assets or properties as security. Your Credit History: If you have a poor credit history, you might find that you are offered less favourable deals. No Trading History: If you have only recently started your company, you might struggle to secure credit as you won’t be able to show a history of past success. Some lenders consider newer companies to be higher risk borrowers. The Property Type: A huge part of the lending decision rests on the type of property you are buying. Rates can differ depending on the kind of property you are buying. Most commercial mortgages tend to last between 12 and 30 years. It’s not uncommon for some to last as little as three years or as long as 40. This all depends on the value of the property, your deposit size and the affordability. There is no standard length for a commercial mortgage as they are all bespoke. Small businesses will have access to the same range of commercial mortgage products as any other company. The size of your company doesn’t matter, all that matters is your deposit or security and the affordability of the loan. Startups might find it more difficult to secure a business mortgage as most lenders will want to see evidence of past trading. However, some will accept a larger deposit and strong business plan in lieu of trading history. In many cases, startups can secure a commercial mortgage if their directors are willing to put up additional security to help offset the risk. Do you still have questions about the commercial mortgage process? Don’t worry, you’re not alone. Commercial mortgages can be very tricky to navigate, which is why we have put together this guide. If you still have questions, hopefully, the following frequently asked questions will help. Can a business take out a mortgage? Yes! Commercial mortgages are available for businesses of all sizes, and individuals can also apply for a commercial mortgage. How long will it take to get a commercial mortgage? With so many different steps involved, it’s difficult to say how long it will take for a commercial mortgage to be completed. This will all depend on the state of your business, the lender you are applying to, and the type of property you are buying. It could take as little as a few weeks if everything is cut and dry, but this could also take much longer if the lender needs to carry out extensive checks. Can I secure a leasehold business mortgage? This will only be possible if the property has more than 70 years left on the lease. You may need to provide additional security if this isn’t the case. Can you help me secure a commercial offset mortgage? Some lenders provide offset commercial mortgages and others don’t. An offset commercial mortgage allows you to link your mortgage to a savings account, meaning you can reduce your interest payments. For example, if your mortgage is £150,000 and you have a £50,000 savings account, you could offset the amount and only pay interest on the £100,000. In order for this to work, your savings account will need to be with the same provider as your mortgage, so this can limit your options. What are the different types of a commercial mortgage? Leisure: Restaurants, clubs, pubs, gyms, casinos etc. Semi-commercial: A flat above a shop, for example. Retail commercial investment: Retail units etc. Industrial: Including warehouses, storage facilities, etc. Care homes: Nursing homes and hospices. Professional: Doctor’s surgery, vets etc. When securing a commercial mortgage on any of the property types listed above, the rates will vary depending on the building type and your mortgage type. For example, a retail commercial investment that you intend to rent out would command different rates to a retail property you plan to use for your own business. It is very likely that you will have to pay stamp duty, so this is another expense which you need to consider. Stamp Duty Land Tax (SDLT) must be paid on all commercial land and property purchases over the value of £150,000. Rates will vary for leasehold and freehold. This table shows how Stamp Duty is charged on commercial property purchased on a freehold agreement. This table shows how Stamp Duty is charged on commercial property purchased on a leasehold agreement. Will I be accepted for a commercial mortgage if I am self-employed? Some lenders might be willing to provide you with a self-employed commercial mortgage. However, you may be required to provide more security in the form of debentures and personal guarantees. Many mortgage providers are still behind the times with making provisions for self-employed individuals, but some are ahead of the curve. By working with a knowledgable mortgage broker, you have a better chance of being matched with a lender that is more likely to look at your self-employed status favourably. Can I get a SIPP mortgage on a commercial property? It doesn’t matter if you are purchasing on an owner-occupier or a commercial investment basis, most will cap the loan amount at 50% of your SIPP value. For example, with a pension of £400,000, your loan would be capped at £200,000. There are additional factors that you will need to consider when choosing a SIPP mortgage. For example, if you are purchasing for investment reasons, many lenders will want to see evidence of a lease already in place. For owner-occupier mortgages, expect to provide financial statements for your business, including an EBITIDA (earnings before interest, tax, depreciation and amortisation) and sometimes even a business plan. Very few lenders have upper age limits for commercial mortgages, so you shouldn’t have a problem securing this type of mortgage during retirement. Can I secure a regulated mortgage on a commercial property? Commercial mortgages are always unique to each situation. They are intended to be flexible to the needs of the individual and the business. For this reason, most commercial mortgages are not regulated. There are some exceptions to this rule, such as with semi-commercial mortgages. If the property has more than 40% of the floor space dedicated to residential uses, then the associated mortgage will need to be regulated by the Financial Conduct Authority. Do I need commercial mortgage insurance? Business mortgage insurance is not a legal requirement, however, it can offer peace of mind. It will help to cover the costs of your mortgage if your business runs into trouble and you cannot keep up with payments. An alternative to this is business loan insurance, which is a type of life insurance that will cover you in the event the borrower falls seriously ill or passes away. It will cover commercial mortgages, business loans, corporate overdrafts, directors’ loans and venture capital funds. Where can I find the best commercial mortgage quotes? 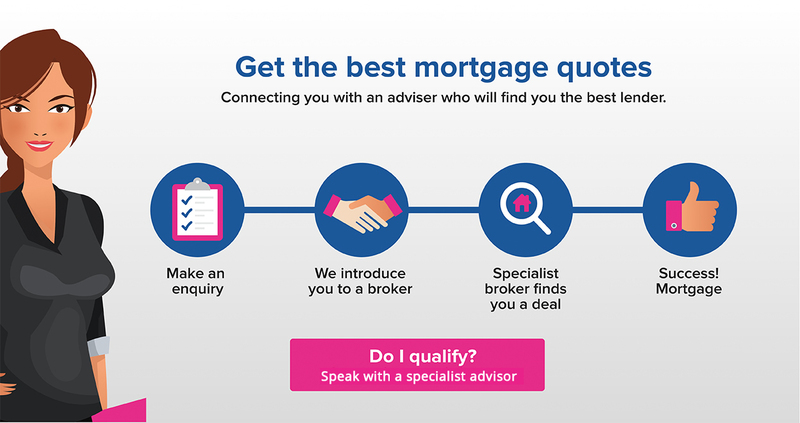 Not that you have a better idea of your needs, you can start looking for quotes by either approaching lenders one by one, or by using a specialist broker to point you in the right direction. If you’re ready to discuss the process of securing your commercial mortgage, you can get in touch with our friendly team by submitting an enquiry. One of our team will get back to you to discuss your situation in more detail and to make sure you know the next steps you will need to take. We help match you with the best mortgage providers for your needs, so you can save time and money in securing your commercial mortgage.